Beautiful certificate from the Stone Mountain Scenic Railroad, Inc. issued in 1966. This historic document was printed by the American Banknote Company and has an ornate border around it with a vignette of the company's train. This item has the signatures of the Company's officers, A.H. MCAFEE as president and SAM G. DETTELBACH as secretary. STONE MOUNTAIN SCENIC RAILROAD FILES FOR STOCK OFFERING. Stone Mountain Scenic Railroad. Inc., Stone Mountain, Ga., filed a registration statement (File 2-21056) with the SEC on January 22 seeking registr;tIon of 105,000 shares of common stock, to be offered for public sale at $6.50 per share. While no underwritingis presently involved, maximum underwriter's commission or commissions to licensed securities dealers would be 151. Such shares will initially be offered at $5.50 per share to present stockholders at the rate of one share for each three shares owned prior to this issue. By terms of a contract with Shepherd Construction Company, Inc., for preparing a part of a roadbed at Stone Mountain, at prices to total about $115,000,Shepherd has the option to receive payment for "first one-half" of work in company stock, and the company has the right or option to pay for "last one-half" of work in company stock; and until these options are exercised the company will reserve 20,909 of the new shares to meet this commitment. 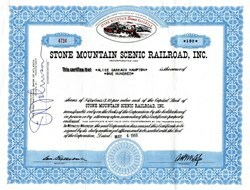 The company was organized in 1960 specifically for the purpose of constructing, owning and operating a railroad at the foot of and around Stone Mountain as a tourist attraction and certain concessions in connction therewith, under authority and agreement and lease entered into between the company and Stone Moun-tain Memorial Association which owns the mountain and surrounding countryside. The company constructed two authentic reproductions of Civil War type railroad depots and two steam locomotives were purchased and one was remodeled to appear as a Civil War locomotive. Six coaches were purchased and remodeled to "antique"appearance and roadbed and track was completed three-fourths the way around the mountain. Under the agree-ment with the Association, the company must pay certain annual rentals depending on amount of gross income. Of the estimated $564,500 estimated net proceeds from the stock sale, $115,000 will be paid to Shepherd Construction (either in stock or cash) for completing the roadbed, $136,800 will be used to prepay a longterm bank debt, and the balance to repair existing track and roadbed, to complete laying of track, switches and spurs, to relay 1200 feet of track and Siding, to repay short-term bank loans and for other expensesof operating and constructing the railroad and concessions. In addition to certain indebtedness, the company has outstanding 295,000 shares of common stock, of which management officials as a group own 4l%. The Stone Mountain Scenic Railroad is a standard gauge railroad that circles the perimeter of Stone Mountain Park in a loop, and provides views of the mountain en route. The railroad utilizes what was originally an industrial spur built in 1869 by the Stone Mountain Granite Company to serve quarries at the foot of the Stone Mountain, with a connection to the Georgia Railroad's main line in Stone Mountain Village. The railroad later started an excursion service to the mountain. The spur was later abandoned, but the right of way remained in place (though the rails had been removed). In 1962, the present day scenic railroad opened, which had rebuilt much of the old right of way, with additional trackage to create a complete, continuous circuit around the mountain. The mileage of the circuit around the mountain is advertised as being five miles long, however, the actual mileage is 3.88 miles. The Stone Mountain Scenic Railroad, privately owned at the time, operated steam powered excursions on the restored trackage. The Stone Mountain Memorial Association (the state-operated owners of the mountain itself) assumed operations of the railroad in 1981. The association expressed little interest in maintaining the steam locomotives, and when the engines became in need of major boiler work or other repairs, the railroad withdrew them and simply ran diesels instead. In 1987, the spur connecting the mountain trackage to the CSX main line was restored, and the railroad hosted several visiting trains, including Savannah and Atlanta Railway steam locomotive number 750. With the connection, the railroad became subject to FRA regulations, in which case the road, just as the railroad to which it is connected, was required to maintain its track, infrastructure, and rolling stock to a certain degree of good repair to be permitted to operate. In January 1998, the railroad was privatized once more when the Memorial Association contracted Silver Dollar City to operate the railroad and the other attractions within the park. Under this arrangement, the state continues to own the railroad, but Silver Dollar now handles the operations and management of the attractions. Silver Dollar City also operates the Dollywood theme park in Pigeon Forge, Tennessee, which has operating steam locomotives, and thus it was believed that, under their management, more effort would be put forth to operate the steam engines again. Unfortunately, SDC, like the state before it, had little interest in operating the steam engines. Many employees had left, and the SDC's operation of the railroad has been subject to much criticism within the railfan community. In 2004, the trackage connecting the railroad to the main line was dismantled and the spur truncated to just before the bridge spanning Robert E. Lee Boulevard within the park's premises. The trackage and decking were removed, though the bridge's girders remain, and the right of way to the west of the bridge was converted to a pedestrian trail, while the railroad continues to use the remaining track to reverse the train's direction. This move had been perceived by railfans as a means to become exempt from having to maintain equipment to FRA standards. However, while the disconnection does exempt the road from certain specific requirements such as the need to observe hours of service rules, and the need for a dispatcher when running more than one train within the park, it remains subject to the FRA's jurisdiction and continues to maintain the equipment and trackage accordingly. In 2011, major upgrades of the track, passenger cars, and diesel locomotives were performed. The diesel locomotives received new motors and other upgrades, as well as a new paint scheme. The steam locomotives received some cosmetic restoration at this time as well. The railroad had de-accessioned its last remaining steam locomotives in early 2013, and currently owns and operates diesels exclusively.